Did you know you can use an inexpensive webcam to capture images of planets and other objects in the night sky? If you are spending time in front of a telescope at a star party you should have an adjustable height observing chair. If you are looking for a telescope be sure to check out the following teh telescop site first. Star parties are astronomy events that consist of dozens to hundreds of people camping out with telescopes gazing at the heavens. They usually occur on weekends near a new moon each month. This page contains a list of all the star parties that we know about. We believe it to be the most comprehensive list of star parties on the internet. We include links the the star party home page. We are constantly updating this page, checking the dates and the links. If you are hosting a star party or other astronomy event please let us know about it. You don't need a telescope to attend a star party. I did not have one at the first star party I attended. It did not matter. There were over a hundred telescopes at the Black Forest Start Party in Cherry Springs PA. Just about everyone was happy to let me look through their telescope. Most astronomers love to share the views through their telescopes. Some of the telescopes at that star party were 25-30 inches in diameter. I remember seeing the veil nebula through one of these big boys. I could not pull my eye away from the eyepiece. It was magnificent. I had never seen so much detail. Star parties and more star parties what is a start party? In a nutshell, star party is a group of people with telescopes, camping in a field, usually in a dark location. Often star parties include lectures, demonstrations, vendor booths, door prizes, and much more. Other star parties are no frills and just include the people, telescopes, binoculars, etc. There are star parties all over the world at any time of year. We began this start party calendar in 1997 when we were looking for information for star parties on the web. There is a lot of information available these days but our calendar brings it all together on to one site. If you astronomy club is hosting a star party that is not listed on this site or it is listed with incorrect information please contact us using the contact form. The Stellafane Convention is a gathering of amateur telescope makers. 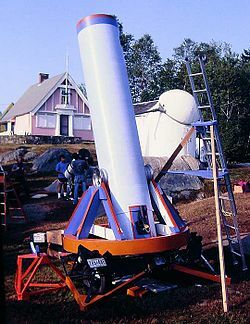 The Convention was started in 1926 to give amateur telescope makers an opportunity to gather to show off their creations and teach each other telescope making and mirror-grinding techniques. All telescopes, commercial and homemade are welcome If you wish, you can enter your homemade telescope in the mechanical and/or optical competition. There are also mirror-grinding and telescope-making demonstrations, technical lectures on telescope making and the presentation of awards for telescope design and craftsmanship.